I got the fourth colour change done and I like how it looks. Generally a doily is intended as a decorative way to protect a table of other surface. The holes in a lace doily let you see the beauty of the wood underneath while still protecting the wood from scratches and dents. 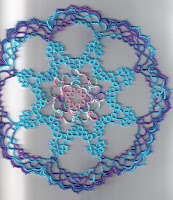 This doily isn't intended for practical purposes, It's just a study in colour changes. It might get used on a table or it might get framed. Then again it might just get thrown in a drawer. 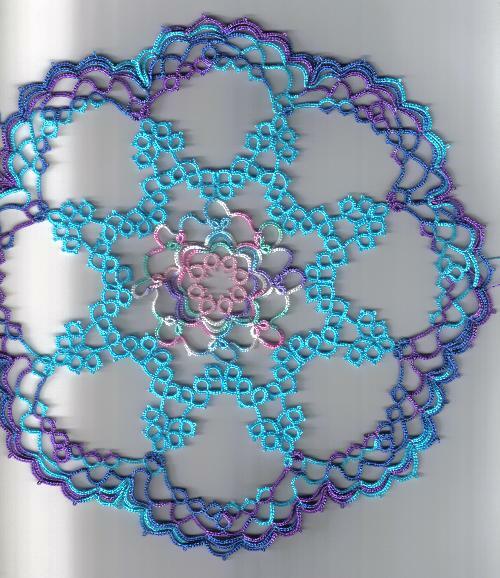 I like the spokes effect that happened in the turquoise row and intend to repeat it on the next colour which will be the dark blue. I actually had the dark blue done ages ago, but I'm not liking how it's looking and I'm cogitating on how to get the effect I want. This will be that last colour change and I'm kicking around maybe adding a single row of chain in the starting pink to follow the contours of the design and bring a little more of the pink into it. Which I could maybe do if I could just get the dark blue to work out the way I want. I've tried three variations so far and don't really like any of them. So I put it aside. What I've been doing instead, is embroidery. Several years ago I did a bunch of butterflies on squares roughly 8x8 inches. I had ideas of doing enough squares for a quilt alternating embroidered butterflies and birds with plain squares. So far I've done 6 squares one of which is a little "cartoonish" and I just don't see that happening, so I thought I'd frame them and hang them on the wall. I started with 8x8 thinking it was a decent size for a quilt square, but in order to block it and mount it in a frame it needed more material to be able to pull it into shape. So I added more fabric to the outside making a sort of fabric "frame" and then blocked it by putting a square of masonite behind it and running a thread back and forth into the fabric, first left and right, and then up and down. This pulled the fabric and the stitching, which had puckered due to the denseness of the stitching, until it was flat and smooth. This worked great on the first 4 designs. The last one didn't work so they've been sitting there ever since. Last year I thought I'd just start with a picture with the intention of framing it. I scoured the internet and finally came across a picture of a bird with flowers that I thought would work. I printed it out on standard 8.5x11 and then ironed it onto the fabric just using a laser printer. The toner wears off so I worked quickly just sewing enough of the outline so that I could work from it. Then it got put aside while I worked on something else. I found it several weeks ago and decided to work on it again. TaDa! More embroidery finished. I want to get this one framed and hung, and knowing that I might have puckering issues I was careful to keep it taut while working it. When I washed this one and pinned it out, it stayed flat. Now to do something about framing it. 8.5x11, like 8x8 isn't exactly a standard frame size. Just in case you think I've forsaken tatting, I did do a couple of bookmarks. One which I think turned out quite nice, but I for got to take a picture of it, so I'll have to do it again. Maybe this time I'll use a double bobbin shuttle so I can get a better effect. That will probably have to wait because I have another picture already started in my embroidery hoop. The doily is coming along beautifully !!! Looking forward to your next round. 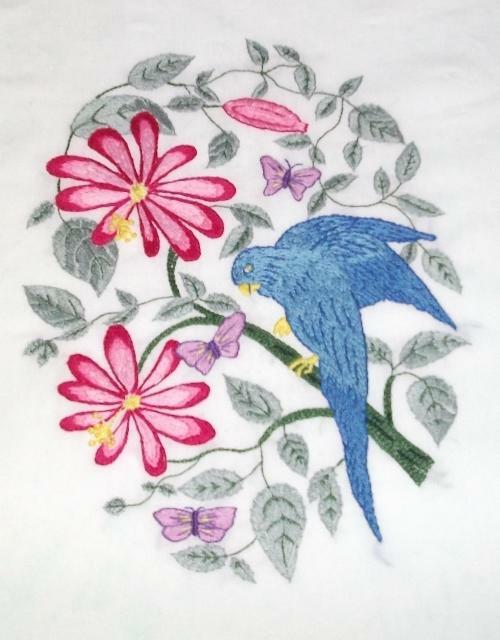 I love embroidery, but can't do it much now because of weak eyesight. Hence shuttles are my constant companion now. I like the openness of your doily. The embroidery is splendid, it will look fantastic framed.